Red Dwarf helps UKTV to record-breaking year. We've already reported previously on the successful ratings figures garnered by Red Dwarf XI - but this week, a little more context has been given to just how significant they were. According to a new official report, Red Dwarf played an instrumental part in UKTV once again breaking its own annual viewing records in 2016. The broadcaster's share of commercial audiences hit an all-time high of 9.87%, and at the top of the pile was Dave, which is the most-watched non-Public Service Broadcaster (the PSBs being BBC, ITV, C4 and C5) channel in the UK. And the most-watched show on Dave? Why, just a little thing called Red Dwarf, which brought in total audiences across all showings of over 2 million viewers per episode, with "total consumption" peaking at 2.4 million. Series XI also brought record-breaking figures to the on-demand UKTV Play service, and an unprecedented volume of new user signups. Which is all a bit good, really. 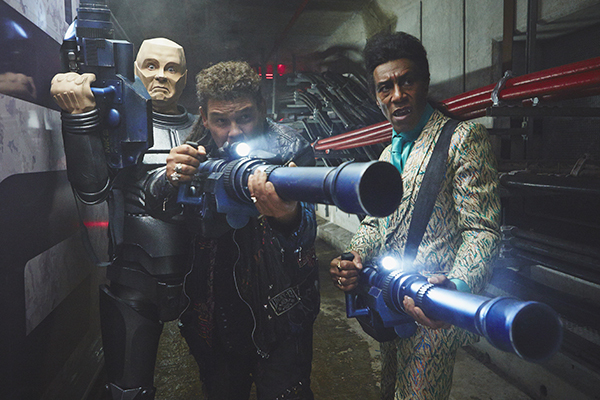 Catch up with Red Dwarf XI on UKTV Play!